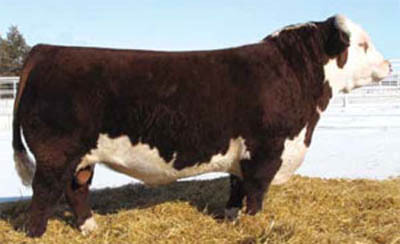 Horned Senior Champion at the 2011 National Western Stock Show, USA, Vendetta is a bull to breed volume and bone. Note he is a Trait Leader for 200D, 400D & 600D EBVs. Tondara Herefords have shown a son very successfully being awarded Supreme Hereford Exhibit at the 2014 Royal Melbourne Show. Vendetta’s progeny are appealing to the eye and carry their sire’s carcase traits and volume. We have ten young daughters in herd and his six Mawarra sons have sold to $12,000 (two at the Herefords Australia National [Wodonga]). Vendetta will again be represented by a son in our Herefords Australia National (Wodonga) team, see Lot 114 Mawarra First Mate (AI) (ET) (H#).